Description: Pinky Winters is a wonderful Los Angeles-based jazz singer. She started singing professionally in the 1950s, took some time off to raise a family and resume her career in 1978. She's never stopped singing since then. She may not have the most powerful voice in the business but uses her instrument very effectively, and her singing style reflects her gentle and sweet personality. She's enjoying a sort of resurgence since she forged a fruitful relationship with the Japanese label SSJ Records who has released several of her albums in Japan since 2006 and invited her to tour Japan several times. 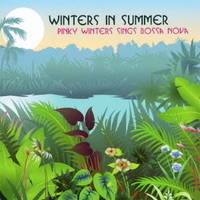 Winters In Summer is a Bossa Nova album Pinky wanted to make for a long time. Here she is supported superbly by a band of top-notch L.A. musicians led by the wonderful pianist and arranger, Jim Cox. In addition to well-known Bossa classics, Pinky included the opening number "Another Rio" as a nod to its composer and her long-time collaborator Bob Florence. "I Concentrate On You" is an hommage to Frank Sinatra who recorded it in his famous album with Antonio Carlos Jobim. Recorded June 21 and 22, 2010 at Umbrella Media, Chatsworth, California.